1) Home appliance:Electric fan,air conditioner turning leave,Microwave turing plate,Quartz heater,Dishwasher,Can opener,Knife sharpener,washing machine,citrus press,juicer,etc. 2) Electric indoor and outdoor decorations:Rotating electric table,Stage curtain,recorder turing light,decoration lamp,Optical fiber turing lamp,Christmas tree,Rotating electric Advertisements and shelves,etc. 3) Electric machinery:Vending machine,automatic electric instruments And meters,Rotating TV antenna,etc. 4) Scientiific and teching devices:Rotating electric models,Electric curtains,etc. 6) Industrial area:Electric transit instrument,etc. 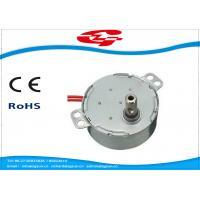 Motor can be customized according to customers' requirement . Q . What kind motors you can provide ? For now, our company provide 7 categories motor include synchronous motor , shade pole motor , stepper motor , bldc motor , capacitor motor , permanent magnetic dc motor , and ac universal motor . Almost of these motors are designed for home appliances . Q . Is there a MOQ for your motors ? Yes . The MOQ is between 500-1000pcs for different models after sample approval . And it's also okay for us to accept smaller lots for the initial order . Q . Could you send me a price list ? Most of our motors are not standard products , they are customized based on different requirements like voltage , power, lifetime , noise, and shaft etc . Thus , it's really difficult for us to provide a price list . If you could share your detailed requirements and annual quantity , we'll be sure to offer a very competitive price . Q . What is the payment ? Payment method . TT/ West Union/ Papal/ L/C/ Escrow payment are all available . Payment Way . generally , we accept 30% TT deposit and balance before delivery . After building long and good relationship , better payment way will be provided . Q . What is the lead time ? The delivery time is 30-35 days after order be confirmed . But for the exact date, please check with our sales team . Q . What is your company return policy ? Refund or exchange is promised for defects not damaged by users . You can take photos or video to us for approval first , and then give you a new one during next order .